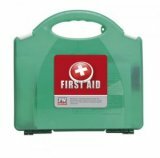 Our First Aid kits are designed for both workplace environments and domestic safety. The contents are in accordance with current legal requirements. Don't be caught out as accidents happen.